As we get on in age, we become less physically able. Still, it's important to be agile, and for this, exercising is imperative. To continue to be able to manage our physical functions and prevent us from being physically injured or declining cognitively, we need to remain fit and healthy. For this, we need to invest in just one piece of home exercise equipment, of which the best is an exercise bike for seniors. 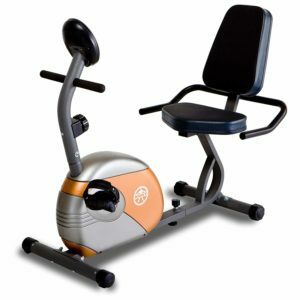 However, the market is rife with exercise bikes, so choosing the best recumbent bike for seniors is a sensitive task. As we grow older, it becomes more and more important to maintain a good cardiovascular health. This is the kind of support seniors get from riding an exercise bike. By cycling for a minimum of five minutes a day, seniors can improve their blood circulation, normalize blood sugar levels and reduce high blood pressure. With these results, seniors can keep clogged arteries and heart attacks at bay. With age, the joints and the overall skeleton weaken, making seniors prone to injury and falls. However, due to the high impact of certain cardio aerobic exercises, the joints could be affected, for instance, skipping or running. For instance, if a senior takes to running for exercise, each time his foot makes an impact with the ground, it will send a shock which will travel up his skeletal framework and impact his joints and bones. On the other hand, exercising on a recumbent bike makes one’s movements smooth and fluid. It also gets the heart to pump without putting any strain on the joints. Since stationary cycling is the least stressful of all cardio exercises, it is the preferred choice of many, including seniors. You can exercise on your cycle every day and so reduce your risk of injury since this activity lowers your mechanical stress on your knees, back, hips and ankles. There’s another fallout of age to consider here: body stiffness. Often, due to stiffness in the joints, movement becomes increasingly difficult in old age. This happens because as seniors, your movements aren’t as much as they used to be, and you devote less or no time to physical activities. For this reason, exercising a little each day is critical as it renews muscles and ligaments for enhanced mobility. It does this by focusing on greater movement in the legs, which as you know, is the basis of the body. Doctors also say that if seniors use exercise bikes, they will experience enhanced muscular flexibility and have a better range of motion. By constantly rotating the legs to move the pedals of a bike, all the muscles, tendons and ligaments of the lower body are stretched and strengthened. This increases mobility as the body now gets accustomed to movement again, and the body becomes more flexible and stronger. Additionally, the lower back muscles are also strengthened and do away with back pain that seniors usually experience. Workout programs: Usually, consoles on exercise bikes let you choose programs according to your fitness goals. By being so structured, goal-setting becomes disciplined and effective, and you stay motivated in the long run. There are bikes with extensive workout programs that allow you to build any aspect of your physical fitness—strength, cardio, etc. They could even change your resistance level. Digital console with LCD screens: This unit helps give you a picture of your position in your workout. With inexpensive bikes, you could receive very minimal information, and you probably will have to do without a backlit screen and most of the features of premium models. Heart rate monitors: For more accurate heart rate monitoring, you should look for models where these monitors aren’t in-built. Instead, the unit should be synced with an external chest strap heart rate monitor. User settings: To customize and personalize your bike so that it recognizes you and your height, weight, name, age, fitness goals, etc., you need to buy a model with more user settings features. Bluetooth connectivity: With Bluetooth connectivity, you can play music while you work out and some apps like MyFitnessPal to track your progress. USB port and data exchange: Some high-end recumbent bikes are designed to charge your mobile phones while you exercise. For this, a data cable is usually included. Speakers: Some recumbent bikes can also play music while you work out, though the speakers aren’t always of the highest quality. Other features: If you want to catch a movie, read a book or surf the net while you work out, some bikes come inbuilt with a tablet, smartphone, and Kindle holder. The more features your bike has, the easier and more convenient it will be to use. It will also give you more exercise options. However, if you aren’t keen on all of those, make a list of what you want and ensure that the one you buy has all of them. This way, you can hold down the price line too. The recumbent exercise bike reviews presented here are guidelines for you to choose a good one for yourself. Now that you know what features to look out for in a recumbent exercise bike let's take a look at three typical exercise bikes for seniors. There are many good reasons why seniors should opt for the Exerpeutic bike. For instance, take the fact that it’s a foldable recumbent exercise bike. This is a big advantage for seniors who can easily and quickly fold the bike and put it out of their way so that they can use clear space to walk. Then, it also has enhanced ergonomics and is highly space-efficient. It is designed to be so robust that it can easily take the rigors of an intense workout. It has all the virtues of being a top-rated exercise bike: comfortable semi-recumbent, affordable and adjustable to various heights. Since its design is semi-recumbent, seniors find the Exerpeutic recumbent bike easy to get on and off. The LCD display helps track their progress. This one is full of necessary statistics and information such as heart rate monitoring, speed, time, distance and calories. The seat is large and well-cushioned so that it's comfortable to sit on for an extended period. This bike affords users a smooth and quiet ride due to its V-Belt Double Drive Mechanism, coupled with a precision balanced flywheel. It also comes with eight levels of adjustable magnetic tension control system. It works silently even at high speed and if set on the highest level. It can work without the computer as resistance is set manually. Folding and unfolding this bike is easy to do. While you can use this bike for a good exercise workout and can actually lose weight too, it can’t give you an intense workout like a spin bike or fan bike can. Still, it is highly dependable for low impact cardio exercises that you can do comfortably in the privacy of your home. Along the lines of the Exerpeutic bike comes the Marcy ME-709 with similar features that would benefit seniors. A large and comfortable seat and backrest that gives adequate support are top benefits here. Overweight seniors will find this beneficial as this is the best exercise bike to lose weight. This recumbent exercise bike for seniors is best described as being comfortable, simple, compact and quiet. It balances its simplicity by offering a huge range of amazing benefits that you would normally get from larger models and expensive ones too. 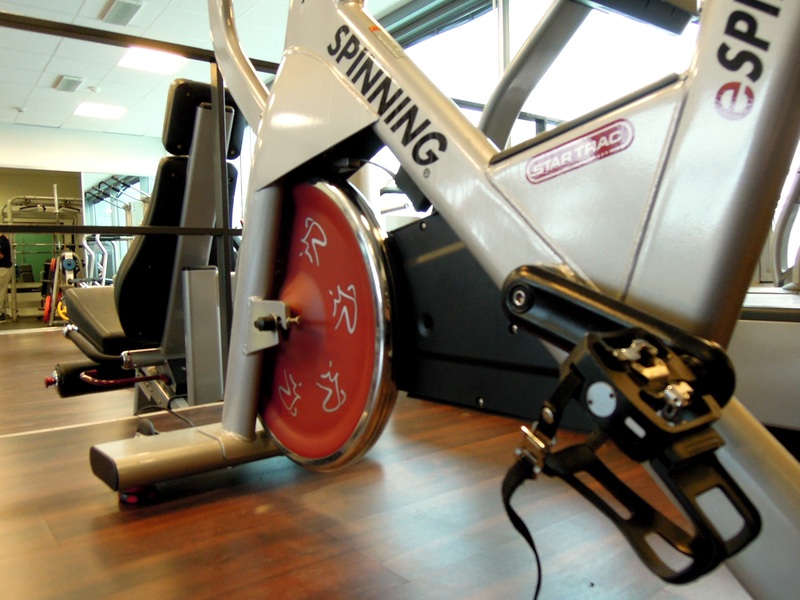 The Marcy stationary bike comes with a twist knob which can be used to change resistance as you cycle for eight tension adjustments. It allows users to improve their cardiovascular health, reduce fat and increase stamina. The LCD screen up front tracks speed, distance, time, and calories. Its powder-coated finish and heavy-duty steel tubing framework ensure that this bike is robust. 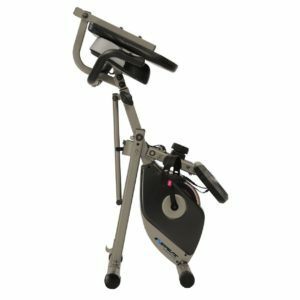 Seniors find it easy to get onto and off this portable exercise bike due to its weighty, counter-balanced pedals and large-sized straps. The seat is comfortable and adjustable while the backrest gives sufficient support. Handlebars also provide support, being foam-covered. It is easy to store since it is foldable. Transport wheels are included. This stationary bike is not equipped with a heart rate monitor, important for seniors. The resistance doesn’t go to a level that makes a workout challenging. As a senior, if you’re on the lookout for a decently made, affordable bike, you’ll be very happy to own a Marcy ME 709. It is made for light cardio workouts, building strength and stamina and can help you recover from injuries. These virtues make it the bike of choice for seniors. The Schwinn recumbent exercise bicycle is the best exercise equipment for seniors. It offers all features and conveniences that a premium model would have and more. This is a good option for seniors, since it offers 20 resistance levels, making it perfect for all skill levels. Excellent in the mid-range of exercise bikes, it has it all to help with body toning and loss weight and enhancing comfort. It also has a vast range of useful features which aid the user to have a workout that will help him reach his workout goals. The Schwinn 230 is a low bike, which makes it easy for seniors to access. It has a two-track, two LCD window system which allows monitoring of a maximum of 13 display feedbacks. Its user capacity is 136 kg, though it weighs only 37 kg. For additional stability, the frame has a center support. It is equipped with nine pre-set workouts, eight heart rate control workouts, 20 resistance levels and 22 program modes of training support. Data can be stored in a USB drive and can be connected to the Schwinn Connect website. It offers two user profiles per head to share information. The bike is adjustable to cater to different user heights. It has a heart rate monitor. It comes with a 10-year warranty for the frame. Before you go gaga over the slick and smart exercise bikes you see in stores, check out their prices. While the least expensive of them cost a little more than $100, top-of-the-line models could reach $1000. Though the most expensive ones are the best too, yet, you still need to choose only according to your needs and budget. Have a budget for your buy and stick to it. Have you measured out the space you need for an exercise bike in your home? Though some bikes are large and need more space, others are a compact size and can even be folded. So, before you buy, be sure that you can safely house your bike without cramming up your room. To ride an exercise bike for about 20-30 minutes a day, you need to be comfortably seated. Since there are several different kinds of bike models these days, they come in different shapes, and this influences the seat design. Still, comfort is a big feature when buying an best recumbent bike for seniors. This is one more influencing factor when buying an exercise bike. Whereas some bikes can easily be assembled, others are far too complex to assemble because the work is more intricate. For seniors, the choice of exercise bike would hinge to a great extent on the easy assembly of an exercise bike. If some seniors are good with DIY installation projects, this won't pose a problem, but if not, look out for models with easy assembly, or pay for installation with your purchase. 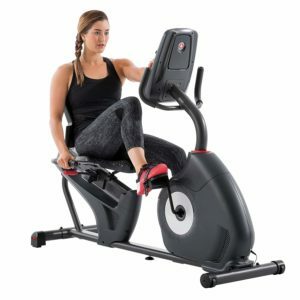 By reading these reviews and understanding your needs, you can choose a best recumbent bike for seniors and reap all stationary bike benefits related to your health and well-being.